This is a guest-post from Tim Ellis, author of Seattle Bubble, a blog and forum dedicated to real-estate market conditions in the Seattle area. Tim is a long-time GRS reader. Previously on GRS, Tim has written about renting vs. buying and renting in a new city. A localized variant of this post appeared on Seattle Bubble earlier in February. Before I got into the blogging and real-estate analysis business, I spent the first decade or so of my career doing electrical engineering (i.e., circuit design, PCB layout, etc.). In the world of custom electronics, it seems that every customer wants their widget to cost just $5, be packed with features that are 100% reliable and have the design completed in a week. Obviously, it's impossible to achieve all three of those goals at once. The key to a successful project lies in the ability to figure out which of those ideals the customer is willing to compromise in order to get the other two. Are the most important goals to have a reliable, feature-packed device with designs delivered in a week? No problem, but it's going to cost you (a lot). Does the device have to be cheap and delivered fast? We can do that, but we're going to have to cut features and sacrifice some testing. The saying we used to describe this process is one you may have heard before: “Fast, good, cheap: pick any two.” This concept is sometimes known as the project triangle. One of the worst decisions you can make when considering price is to borrow the maximum a bank is willing to lend you. Since you're reading Get Rich Slowly, I think it's safe to assume you're going to have a more conservative target price. Maybe you can “afford” to take out a loan big enough to buy a $400,000 home, but it's important to you not to go above $275,000. Figuring out whether you are able and (more importantly) willing to compromise on price is usually pretty straightforward. Pick a number that works for your budget, and stick to it. Quality can mean many things to many people. Here, I'm using it to mean things like the size of the house, the size of the land, the age of the house, the architectural style, and the finish quality of the house. Is one of your top priorities to have a move-in ready home that doesn't need any work? Or perhaps your family of six needs no less than 2,000 square feet to fit everyone and their stuff. Think about picking quality as one of your two priorities. “Drive 'til you qualify” (i.e., buying a nice home in some far-flung, inconvenient suburb) is a trap that all too many people fell into during the bubble, and now they're stuck commuting an hour or more to work and spending half their life in a car. However, if price and quality are extremely important to you, maybe location should be what you give up. Decisions on price, quality, and location are not a simple yes or no choice, but a give and take. If you're willing to give up the perfect kitchen, you can pay a little less. If you broaden your home search to include some slightly less upscale neighborhoods, you can get a better house for the same price. You get the idea. The price, quality, location equation is probably the way most people intuitively shop for a home already. With this semi-formal framework, you should be able to make better, more intentional decisions as you search for the home that has just the right combination of factors for your budget and lifestyle. J.D. 's note: This principle applies to a lot of things in life. In fact, as I've learned to become a Satisficer instead of a Maximizer, it's become clear that this involves making trade-offs. I often have to give up something I want in order to have everything else be awesome. Usually, it's worth it. There are 42 reader responses to "Setting Your Homebuying Priorities – Price, Quality, Location: Pick Any Two". Around here we say that summer is the price we pay for affordable housing. Great points! My wife and I will be looking for a place soon, and we both understand that we won’t find our perfect house for the price point we’re willing to spend. There will be comprimises – either on Price, Quality, or Location. Oh, isn’t this the truth!! I was lucky enough to get a 1300 sq. ft. house within steps of Lake Erie, on ~1/5 of an acre, for just over $100,000. The compromise? A 25 minute commute, and a *complete* gut of the house – an 82-year old, previously-rented (with the owner living out of town, so no one supervised ANY of the “upgrades”, hence my new roof which replaced one less than 7 years old, the insane wiring (what do you mean, the kitchen lighting is hooked up to two breakers?? ), and more). Fortunately, my dad is doing most of the work, with my help, so economically, it makes sense. I’ll end up with a house worth somewhere around $200,000 (hard to estimate, since houses in this area go from a low of $50,000 to over one million – talk about location mattering!! ), with a mortgage I can easily afford. And most importantly – the land, which around here can be (almost) priceless! And this is why I won’t be able to afford buying where I live (DC Metro area). I LOVE the location, a lot. I make < $60K/year and well, the cheapest I could find even a studio condo would be far more than I could realistically afford. I started saying this line to my Wife during our extended housing search. I would often also say you can change anything about a house except its location, so that is the one thing we should not give up. We ended up with a house at a good price, nice quality for its age, and in a very nice area that is centrally located, except on a busy street across the street from a cemetery. I will always wonder if we should have taken more of a fix me up on a quiet street. I find location is a pretty tricky concept for many home buyers. People idealize certain neighborhoods without knowing what it’s like to really live there. I remember my real estate agent telling me about a retiree she was working with who kept looking at condos. After all, isn’t that what you’re supposed to buy when you retire? It wasn’t until the buyer realized that she never saw anyone in the condo complexes (they were mostly working people and grad students) that she realized this was not the right location for her. Her agent found her a house downtown where she could indulge her more social side. I always advise my clients to spend lots of time in a neighborhood before buying there. Visit when school lets out. Walk around on Sunday afternoons and Saturday nights. Chit chat with neighbors. Visit the local hangouts and ask questions. As you said, you can’t change location. I always like to simplify and just focus solely on location. If you purchase a property in the correct location, quality is something that you can improve if need be. As for price, I think it is pretty simple to see if a property is overpriced. I wouldn’t necessarily use price as a factor when choosing whether or not to buy a house. Alternatively, I would use price to decide whether or not to even consider/begin looking at a certain house. A house that is priced well above market range usually means you have a seller who is delusional about what their house is worth, or a realtor who duped the sellers into thinking the house was worth more, just so he or she could get the listing. Location is the only one of the 3 criteria mentioned that can never have any flexibility (unless you are buying a mobile home, and I certainly don’t recommend that). I completely agree. When we were in the market, it seemed it was a constant game of give and take in order to find a suitable home that wouldn’t involved going bankrupt or being more than an hour away from our jobs. Great points! It’s also important to note that the relationships between the three factors are not always symmetrical. In a high demand area (good location), a large percentage of the house value (as high as 100%) will be determined by the location (land value). In other words, a $700,000 house might be $600,000 for the land and $100,000 for the building. Buying a fixer in that area will save some upfront money, but you would still be looking at $600k or more. So you might not be able to just sacrifice one factor (quality) and gain in the other factors (price, location) as much as you’d like. Well, my wifeI ended up sacrificing a little in the location and quality category. We wanted to live in a location that we had previously rented in, but you would have had to buy a 40 year old house for more than we were willing to spend. Following that, we looked at our second choice of neighborhoods and settled there. The settling on quality over price comes in when we were refusing to spend $10,000 more on the first house that we put an offer on. The owner was not willing to come down. In fact, the owner’s first counter offer to us was $10,000 higher than the asking price. Crazy, right? Anyway, we got the price and our second favorite location, but we ended up with a slightly smaller yard and kitchen. I would also consider the bathrooms to be better at that other house, too. I do feel that we made the right choice, and I would gladly make the same choice again. “Price, Quality, Location” I like how it’s so concisely stated. It seems so obvious now that I read it. We definitely sacrificed quality – small house, didn’t have a great layout, needed a good bit of work. Even then, though, we saw that one day we would be able to add on and make the house more suited to our needs and wants, which is what we did. Quality just seems the easiest to me to compromise, but I hear from realtors and see with my own eyes that houses that aren’t in tip top shape sit and sit and sit on the market these days. I mean, you can afford what you can afford and you can’t change the location but unless the place is unlivable, quality for the most part be improved gradually over years. This makes me feel better about our house…we got good quality for the price, which was an amount we could afford, but the neighborhood is not our favorite place ever. We’re saving up to move in, oh, ten years, to a place where location and quality will be our two. spouse and I are now in contract to downsize & down-$ our home – we chose (relative) location and price as our top 2 items. We got the price low enough for our budget through compromising on absolute location – we’re moving to a lower-cost area that is nearer to family but still has attractions for us. Condition, we have some experience in rehabbing and expect to spend almost as much as the purchase price on pre-move-in fixes (purchase price will be almost 1/3 lower than the initial asking price due to a market with plenty of better-condition inventory and the poor condition of this home, and works out to $44 per square foot; or $33psf if you also count heated area in the walk-out basement). Luckily, the house is structurally sound – I don’t think we’d be buying it if the foundation or roof had issues, they would cost too much to fix relative to house prices for the area. If condition is what you are compromising on, make sure you make an inspection by a licensed/certified home inspector a condition of your offer. 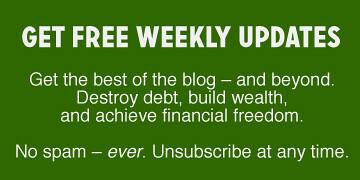 I love the rule of three approach – for organizing, would it be time, money and free space? I think the problem that many people face is that they *think* they understand the scope of compromises that their budget forces upon them, and then act from that viewpoint, without regard for reality. Like the people on HGTV or wherever who insist that their starting home in a competitive market “must” have granite counters and stainless steel appliances. A lot of times when they don’t see that particular feature in their budget, they end up buying at a much higher price point than they originally were contemplating or spend thousands of dollars right after moving in to upgrade to these “necessities”. When we looked at homes, we first dipped our toe into the market in November, and were being shown brand new 2000 square foot gorgeous houses. By April when we were ready to buy, prices had risen so much that we were only being shown 1800 sq ft older homes with lots of issues. If we stuck to our guns and insisted upon houses as nice as we’d originally looked at, we would have spent a lot more money than we could have afforded at the time. As it turns out, we made a lot more compromises, and ended up finding a much smaller but extremely well-priced home in a great town. While many people who bought in our time frame have lost money, our home has continued to appreciate. I do take exception that size is an indicator of quality. The author can keep his McMansions, I'm only looking at homes around 1000 sq ft. Location, purchase price and property taxes guided my decision process. I might be able to afford the home, but not the high property taxes, especially if I was going to be there long term. I wanted a “fixer upper” because I knew the property value would increase faster than if I bought a designer house with all of the amenities. Some people don’t like doing the work or living in the house while it’s being done, but it gave me satisfaction to have counter tops precisely the color I wanted insteadof what the previous owners selected. I’m definitely a “bring your hammer” guy. A big thank you for leading me to another gem of a website http://www.thomasjstanley.com. I just read a couple of articles there and really really liked them. Looks like a worthwhile website to spend my time. I make $46,000 per year. Two year’s ago I purchased a house for $188,500. I financed $150,000 of it. Sometimes I feel like I should I have bought a cheaper house. When I bought my house I didn’t even ask my bank how much I could qualify for. I figured out what I wanted my mortgage payment to be, and worked backward from there. I got a good price, good location, and as for quality… it had very good bones ;-). I’ve put a lot of work into it in the last 4 years, and I love how it’s customized now. I disagree with the very premise of this article. The assumption of this article is that real estate pricing is stable. The truth of the matter is that real estate is completely overpriced and out of line with affordability. The market is saturated with inventory and behind that inventory is a shadow inventory of houses that have been foreclosed on but are not being put up for sale by the banks because they don’t want to “saturate the market with inventory” and behind that are the houses in the foreclosure process etc etc. I say that there is another element that the author didn’t include in his analysis. That element is time. The only direction real estate is going in the foreseeable future is down. So you may not have to sacrifice price, quality or location if you can wait it out. I’m renting now and I figure I’ll buy a house sometime in the next 2.5 years. I’m hoping to see prices drop another 10 or 20% by then. Anyway, this is a great article and just super simple and to the point. Nice info graphic, nice thinking, good basic home real estate theory. RE: Chris @ 22 – Obviously you have never read my blog if you think that I wrote this article with an underlying assumption that home prices are stable. Sorry, but your assumption about my assumption is incorrect. Another thing to consider, and I know this is hard to think about when you are young. Homes near public transit, libraries, and a grocery store are better than homes that are not. You can be disabled at any time. I know of an otherwise healthy 27 yr old who had a seizure and lost his license for 5 years — he lives in a beautiful country home and he’s dependent on his wife to drive him everywhere. A huge strain on their relationship. I also disagree with a basic premise of this article–that you’re better off “settling” for a house you don’t really like because you can’t afford anything better. Huh? I’d say, if you can’t find a house you really really like at a price you can afford, you shouldn’t buy one. Why not wait a few years, keep renting or living in your old house–it’s not going to hurt you to wait. Home prices are definitely not going up within the next 5 years or so. You can always move later, maybe prices will go down more, and you can shore up your credit rating, savings, and career so maybe you can afford more. A house is a huge purchase and you’ll likely be stuck living in it for the next 10-20 years. Don’t buy something you don’t like. I don’t know, if you choose a region that’s generally affordable, you can have all three. We have exactly the house we wanted, in exactly the neighborhood we wanted (though I would have preferred a less-busy street) at exactly the price we wanted. It did take a long time looking, and our real estate agent kept pushing us to compromise on location, and kind of whining about how much of her time we were taking up. We know we can’t afford Chicago or San Francisco or DC, but in our little city we can have exactly what we want. That triangulation really fits what we did, we are in the “bring your hammer” intersection! My mom always used to say buy the lowest cost house in the nicest neighborhood you can afford. we sacrificed quality and size for location and price. 10 years later we are still fixing up the house (but on things we want not need to do) and live in a snug little house in a neighborhood we love. @ Bogey #8, don’t be too quick to diss on “mobile homes.” Manufactured housing – new stock, that is – is often more soundly constructed than the mass-produced, quickly-built, barely-inspected “development” houses that went up in such unsustainable numbers in recent years. And I’d also like to point out that manufactured housing does not necessarily equal living in some dire little trailer park on a rural highway. You can put one of them almost anywhere, depending on city codes. I lived in a “mobile home” for most of my childhood, and manufactured housing is definitely a valid option for our retirement property. I would rather spend 200K on a big lot outside a small city, and put in a 60K prefab house, than spend 300K for a conventional house on a tiny lot in the same city. I would not necessarily think an older home is less quality. Given the source of a lot of building materials (i.e. China) and the direction a lot of newer residential neighborhoods are going (large house on a very small plot) people can be misguided when considering the age of their home when chosing to purchase. Ha I thought of another triangulation I’ve been told. In academics if you want a career, I have been told you can have career, good relationship with spouse, children. Can do 1 well, 2 middling, and 3 is impossible. Maybe that’s why I’m not in academics anymore. Nice graphic! Location is the most important factor to me. If it’s in a bad spot, your “investment” will not do well. Price and Quality are second tier consideration to me. Location and price really intersect in a lot of ways. We bought a house on a busline that is also close enough to “downtown” that in pleasant weather it’s a pleasant walk. And there’s a park close enough to walk to, too. And our dentist, grocery stores, etc are all closer than they might be if we’d bought a house in a different neighborhood. It’s not just the work commute, but lots of other ways that location affects how much we spend every month. Spot on! My wife and I are into this right now. This is a big milestone for us and it is frustrating sometimes to find the “ideal”, the “in your dreams” home. We ended up with the two elements – Location & Quality. We realized that we cannot afford the home that we want in the location and quality that we want. We found a home in a location that we prefer and in the price range that we can afford (pre-approved for a lot more but have to be practical). The quality have some very minor issues that we can fix before moving in. 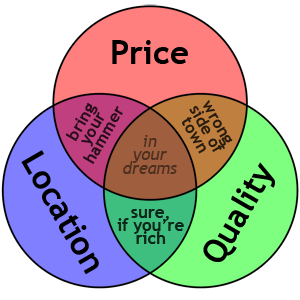 I used this price-quality-location triangle to reason out with my wife. I told her, we can afford a good house, the one that she really likes, but we can only get it in a neighborhood that is less ideal. Too true! This question of “two of the three” was recently reinforced for me when I visited a friend. She & I bought houses 5 years ago for the same price. I bought a 1300 sf fixer-upper on a postage stamp lot in a good town 15 minutes from Boston. My friend bought a 3000 sf brand new house with tons of amenities more than an hour from Boston. The visual aid was great. I think in buying a home, you should base most of the decision on location and price. A home is such a long term investment that having to do a little work over time, and building a little sweat equity is a small price to pay. Before we bought a house, we sat down and made a list: “must have,” “would like,” and “don’t care”. That helped us get on the same page and made clear what we needed vs. wanted. As we hunted, that list was modified – primarily shifting some “must have’s” to “would like”, but also finding a new “must have” that, until we realized it, kept tripping up the search. Some things will be more cost-effective in the long run: my “must-have” was being near “Tier 1″/regular (cheapest) public transit to Boston/Cambridge, which jacked the house price; however, our family now uses the T to get to school & work and our car expenses have plummeted (and we don’t need a 2nd car). A contractor friend told me the #1 damage to a house is water; if your house stays dry, it’ll last nearly forever. If your dream house has signs of water damage, plan on making extra repairs. And if it’s on a flood plain, you need flood insurance, a sump pump, and someone to call to remove sewage from the basement after a bad storm. To me it is all about location and the neighbors that I will have. Things can be fixed and other items will need a good look, but I think that your neighbors are the biggest factor in finding the right home. As someone nearing retirement with a job that has kept us overseas for over 30 years, this is a very welcome post. We plan to retire near family in the outer outskirts of Baton Rouge, LA. I regularly research websites for homes in that area and much appreciate this article and the subsequent comments, and plan to send a link to members of a retirement group I moderate. Can anyone suggest ways to locate a reputable realtor? We hope to buy our retirement home in the next two years and pay it off before retiring. I would very much like to establish a relationship with a realtor soon, but have no idea how to find one. Any suggestions? @26 Mikey, If someone feels that having to drive their disabled spouse around is a strain on their relationship, I think that relationship has other, more serious problems than not living near public transportation or a grocery store. I do live 2 miles from a grocery store; it’s incredibly aggravating because if I forgot something, I can just run out and get it instead of doing without. It’s shot my food budget to pieces. Walking distance from amenities? My dream house, the road wouldn’t even be walking distance!